Remember this deal from a few months ago? It’s back! 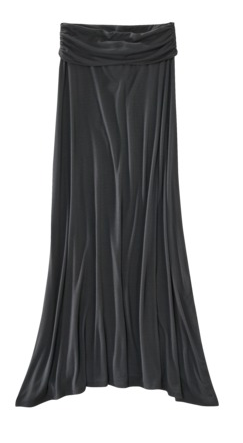 Target’s deal of the day today is this knit maxi skirt by Mossimo, which comes in black, blue, grey, brown and toffee. I don’t have this skirt yet, but I’m ordering it this morning! It looks super comfortable and I’m a big fan of the fold-over waists. The skirt is on sale for $18.99, regularly $27.99, as the daily deal, but there is 10% off coupon code. Enter TGTHTT5Z at checkout to make your total $17.09. This deal expires at 12 p.m. EST 1/15/12. I went through ShopAtHome to get an additional 6% back. Also, if you spend $75 you get 20% off and that can be combined with the coupon code above. I ended up ordering 6 for $77.94(two sizes each of 3 colors) and I figure that I’ll just return the ones that don’t fit and the colors I don’t like/need. I recall this skirt running small. It’s a very nice quality maxi skirt. I bought this skirt when it ran before. It is nice. but thin. Not for this weather! I also have to get mine hemmed because it is quite long!